Stress free and relaxed ... says it all really. 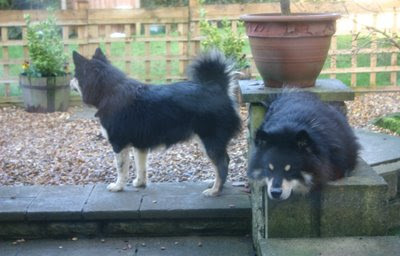 Kanto is a real pleasure to have stay with us - he is excellent company for Kiva - they play together so well. For Mylo it's a case of, hey, "if Kanto is playing with Kiva then I don't have to!" Apologies for the quality of some of these; they were taken through the window. 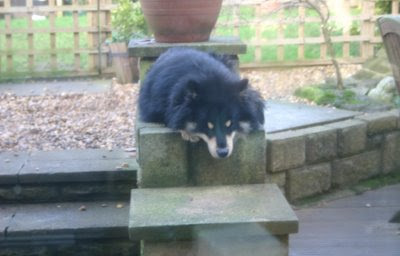 Kanto decided that he was rather partial to the raised bed on the right hand side of the steps into the garden spending much of his time either sitting (above) or lying (below) on it. 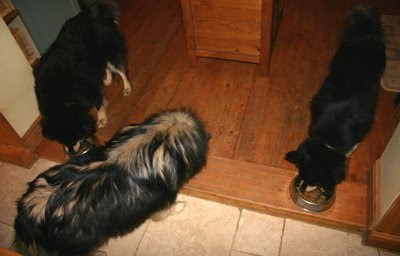 Even meal times were relaxed ... however feeding 3 dogs three different types and quantities was a minor problem. 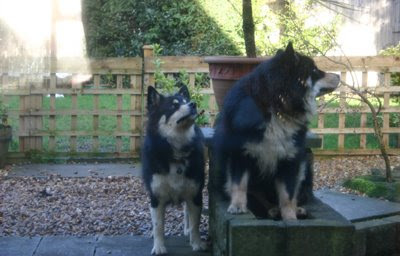 Kanto, who normally eats what he fancies returning to his bowl during the day, had to come to terms that if he didn't eat all he was given then Mylo or Kiva would soon demolish what was left. Kiva had to have it explained to her that she wasn't allowed Kanto's Oscars dried food and had to have her own food and Mylo had to be reminded that he was ONLY to eat his special dietary food. Well that was the plan, however as the picture below shows Mylo was eating Kanto's whilst he was eating Mylo's - oh well, what would one meal matter? 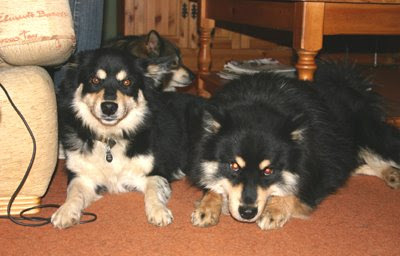 Kanto was collected by Neil on the Friday, Heather (Kanto's husister) had recovered from her illness - he will be missed.